While making our way to the Everglades National Park, Robin and I stopped for a few days for some bird photography on Loop Road inside of the Bid Cypress National Preserve. Loop Road is famous for having countless migratory birds during the dry season. We were not disappointed, the birds were everywhere and not very shy when approached appropriately. I will be uploading some photographs of these wonderful birds soon. 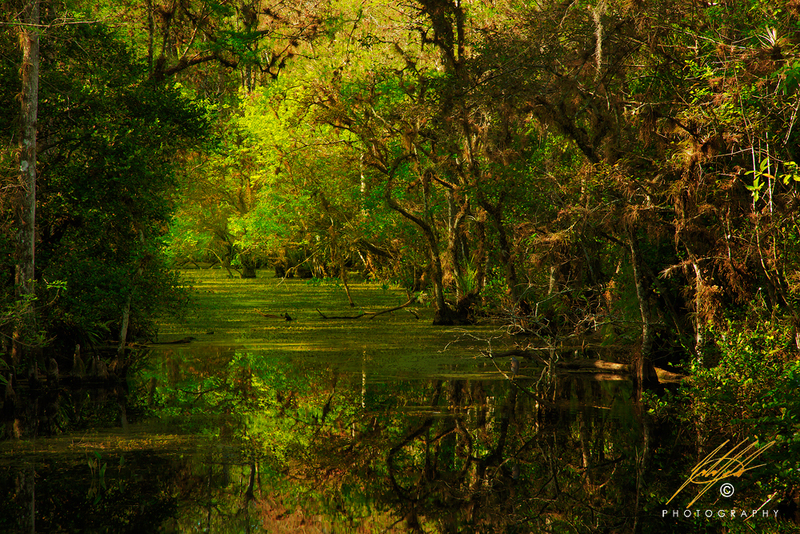 For now I want to focus on the landscape of Florida's wild areas. Half way down the road, there was a large swamp river snaking through the area. Many birds and alligators found themselves very comfortable here. I also found this view into the deep swampy woods to be very attractive. It was midday, but the extremely dense swamp flora softened the incoming light and helped create a glow that is hard to describe. It might sound obvious to look around, but it can be hard to keep an open mind when focusing on an idea. I was able to enjoy this view because Robin helped me notice it by pointing it out and breaking my overly focused determination to photograph the birds. I was glad to slow down and appreciate the landscape opportunity that was right in front of me, but would have probably gone unnoticed otherwise. Canon 6D, Canon 24-105L (105mm), ISO 200, F/14, 1/5th of a second, RAW image processed several times for dynamic range.